Refurbished lanes, a small game-filled arcade, brews and burgers at Decatur’s Suburban Plaza. 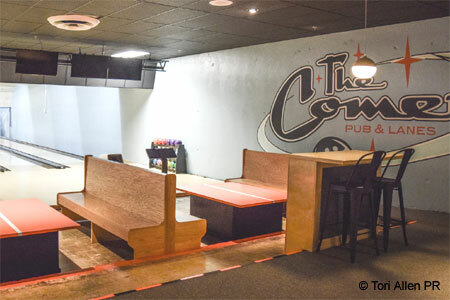 : Complete with a game-filled arcade, flat-screen and large TVs, a friendly bar and high tables for communal dining, The Comet rides the crest of a current: the combination of bowling and high-quality pub fare. A small section of the arcade space may be reserved for private events. Executive chef Savannah Haseler has left the restaurant, and her protegé Shay Harris has replaced her. While we miss her pickled shrimp paired with aïoli, the menu still offers from-scratch fare that includes the brownies and blondies with ice cream for dessert on a bar whose offerings change frequently. Bread for sandwiches, which are excellent, comes from nearby Ratio Bakery. First-rate ingredients are utilized, from the Brasstown beef for the burgers to Springer Mountain Farms chicken for the wings. Many brews are local suds, and so are many of the spirits, making it a fun place to try new libations.